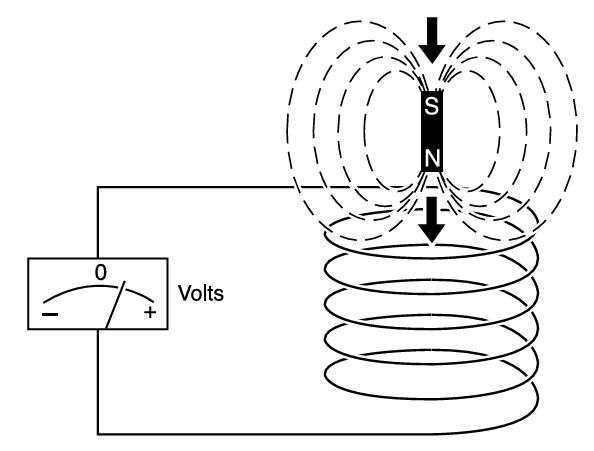 If a bar magnet is inserted into a coil of wire a sensitive voltmeter will show a deflection but only while the magnet is moving. As soon as it stops the instrument reads zero. If the magnet is withdrawn quickly the meter deflection will be in the opposite direction – but again only until movement stops. The quicker the movement, the higher the reading. The fundamental principle which this illustrates is that of electromagnetic induction: any change of magnetic flux linking a conductor will induce a voltage in it. To impose a signal onto a buried conductor by subjecting it to a magnetic field set up by an AC signal transmitter in the vicinity, Section 7. To detect a signal in a buried conductor by amplifying the tiny voltages induced by its field in the aerials of a receiver.